One of the best-remembered lines in Othello is surely Iago’s loud cry at Brabantio’s window: ‘An old black ram/ Is tupping your white ewe’ (I i 89-90), but even before that insulting metaphor, Roderigo refers to Othello as ‘thick-lips’ (I i 67). Iago soon goes on to say, as the play lapses into prose for the first time, that ‘you’ll have your daughter covered with a Barbary horse’ and then makes the charge that ‘your daughter and the Moor are now making the beast with two backs.’ These phrases all occur before we have seen the man himself, who enters only in the next scene. But already the play’s obvious racism has been established. In this production, Roderigo (Steffan Donnelly) and Iago circle round those famous pillars as they quickly bring the whole Globe stage into the action. 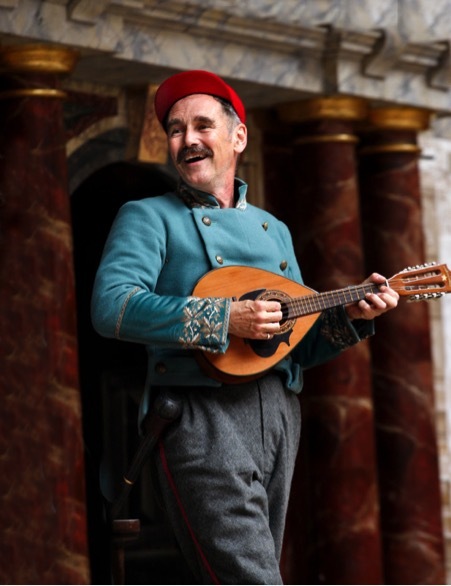 Soon the play requires that Iago dominate the space and the proceedings, but Mark Rylance is so clever in the role that he seems at times uncertain exactly what to do or say. ‘I…I know not that’ is one of his key lines, and indeed he really does seem not to know where the handkerchief comes from. The audience laughs, perhaps a little uneasily, at this brazen lie. He is apparently making it up as he goes along, and this perhaps implies an interpretation of the play in which, indeed, he does not set out to destroy Othello from the beginning (though he claims to hate him, this is first said at I iii 365 merely to manipulate the smitten Roderigo), but as the possibility arises he discovers he can happily do it. Never mind that others, including Desdemona, go down as well. Clare van Campen’s direction necessarily gives full scope to the brilliant Rylance, acting as he does on his own territory (it was he who first directed at the Globe). The production cuts a good deal, including substantial parts of Othello’s longer speeches. It thus risks tipping inappropriately into the comic style that the Globe encourages, and yet tragedy and comedy do interact in many a Shakespeare play. Auden indeed calls Iago “the joker in the pack,” and in characteristic Globe manner Rylance induces an early laugh by directly addressing “many a duteous and knee-crooking knave” (I I 45) among the standing spectators. He thus gets the audience on his side like those other villainous clowns Shylock and Richard III, and only gradually asserts his nihilism. Othello, Mark Rylance. Photo: Simon Annand. Opposite Rylance is the visibly younger black actor André Holland (well-known now from Moonlight and Selma) who, retaining his American accent (an oddity at the Globe, but then Othello is a foreigner), performs with such understated control of himself and others that it is a shock when, in Cyprus, he slaps Desdemona (Jessica Warbeck) hard, and then almost recoiled himself from what he has done. As Lodovico comments, ‘this would not be believed in Venice.’ And indeed, the Globe audience is audibly shocked as well. The couple kiss openly on their arrival in Cyprus, and the audience cheers. Watching the relationship come slowly to pieces is heartbreaking. The women, especially Warbeck’s dignified Desdemona, but also Bianca and Emilia, are fully in charge of the play’s emotions. The willow scene is beautifully done: Desdemona’s voice quavers on the words of the song as Emilia brushes her hair. Emilia is not only insisting, in her down-to-earth way, that women have ‘affections,/ Desires for sport, and frailty, as men have’ when they ‘pour our treasures into foreign laps’ (IV iii 57-88) but she is also trying to build Desdemona’s confidence. The radical difference of Cyprus is marked in several ways. The characters arrive through the audience on carts, one of which remains in the pit for most of the scene, before Iago, demonstrating once again his control of the action, finally opens a hatch to let the spluttering Roderigo out. Cyprus, it becomes clear, is the place for riotous celebration following the defeat of the Turks – for Cassio’s drunkenness, for the group condemnation of Bianca (Catherine Bailey), as well as Othello’s public violence. It is also where Iago can strum his mandolin and sing along, introducing more music than usual into the straight-faced sadness of the play. The contrast with Venice is clear: the nobles there were women, including the Doge (also played by Catherine Bailey), their gorgeous red robes marking their authority. In Cyprus, where Othello was in charge, a distinction was made between the male soldiers and the female townsfolk who danced and drank with the new arrivals. The context was set for Cassio (Aaron Pierre) to be sucked into the atmosphere, and then his hangover. Poor Cassio was shakily unequal to the task of defending himself against Bianca or the implications of the handkerchief. 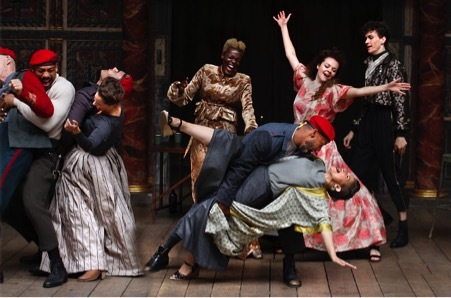 One expects an Iago or Othello to dominate, and indeed this Iago moves objects like bottles and flags around at will, but the Globe’s stage, wide and deep as it is, seems especially to welcome the remarkable black actress (Sheila Atim) who plays Emilia. Her every movement, even her uncertainties, are riveting. She has a playful relationship with Iago, not seeming to know what he wants when she gives him the handkerchief, but laughing quietly with him as if it is some private joke. 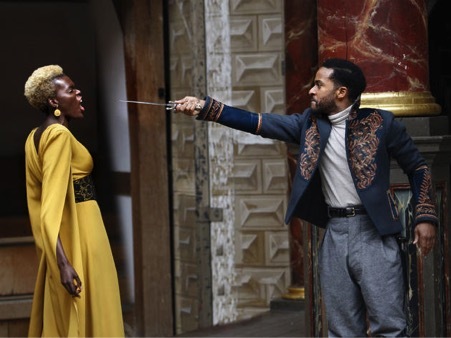 The Globe casting is normally what we have come to call ‘colour blind’, and yet, in a production of Othello, a further black actor could also serve, as here, to highlight the blackness of André Holland. However the audience may have felt about the color casting, when Holland walked forward at the start of the final scene to intone ‘It is the cause,’ the Globe was completely, and unusually, silent. Othello, Sheila Atim and André Holland. Photo: Simon Annand. Every production must have its peculiarity, and here it is undoubtedly the intensity of the feeling displayed between Othello and Desdemona. This made the murder scene especially cruel, even brutal. For a few moments, Desdemona clearly thinks she is going to survive as Othello embraces her from behind and she laughs in relief. Suddenly he tightens his grip around her neck and then holds her down as she thrashes about on the bed before finally lying still. Then, after the ghastly revelations of Iago’s villainy and his own culpable credulousness, Othello is permitted his final embrace and kiss of Desdemona’s body, deliberately echoing that first public kiss. As is by now a long-established Globe tradition, the intensity is soon dissipated (and applause cut off) as the company sings a song led by Sheila Atim, and then two dancers dressed as Othello and Desdemona perform a pas-de-deux, tormented and yet still unable to avoid the mutual attraction. Neil Forsyth, Professor Emeritus at the Université de Lausanne, Switzerland, is the author of The Old Enemy: Satan and the Combat Myth (1989/93), The Satanic Epic, 2002 (both Princeton), a biography of Milton (Oxford: Lion, 2008) and essays on topics as various as Gilgamesh, Homer, Marlowe, Shakespeare, Milton’s Bible, Andrew Marvell, Frankenstein, Emily Dickinson, Dickens, Rushdie, Alice’s Wonderland, D.H. Lawrence, Angela Carter in Japan, Gaston Bachelard, and the relation of art to science. His article on filming the Shakespearean supernatural was updated for an edition of Macbeth in 2011, while an essay on Milton’s Satan was published in the Cambridge Companion to Paradise Lost in 2014. His work on Shakespeare and the supernatural has been extended, and is soon to be published by Ohio UP.